Most impulse purchases eat away at your financial progress. I’m a budgeter, so I regularly set a plan for my spending, saving and debt payments each month. Back when I used to make a lot of impulse purchases, I’d feel defeated at the end of the month when I looked at how much money I spent on nonsense that could have been put to better use elsewhere. There’s really no point in beating yourself up over impulse purchases though. They’ll happen from time to time, and sometimes you won’t regret them because either you have the money on hand or you scored an unbeatable deal. For the most part, impulse buying can hold you back financially and that’s why it’s important to control spending by curbing it altogether or keeping it to a minimum. 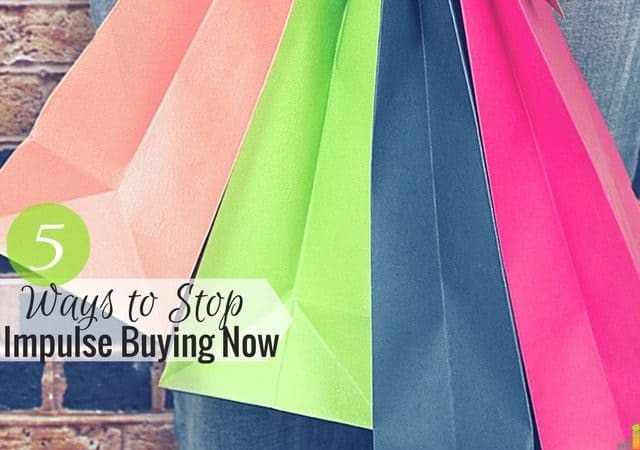 Here are a few things you can do to stop making impulse purchases each month. I can’t remember the last time I went shopping or to the mall just to look around. I usually go with a cold hard mission to get in, get what I need and get out before I spend too much money. While this strategy can help you stay focused, it might not always stop you from picking up that extra item for your home that is on sale. If you find add-on items irresistible, it’s best to avoid shopping as a leisure activity, minimize your trips to the store and find a few cheap or free hobbies. When you do go shopping, know what your weak spot stores are and try to avoid them. My favorite store is Target and if someone were to hand me a gift card I could do some serious damage in there (especially when you factor in their money-saving Cartwheel app and Target REDCard options). In reality, I’m not going to have a Target gift card all the time or be given free money to shop so I will usually just stay away from the store unless I need something important. I used to have no spend weeks all the time when I wanted to reset my finances or stretch my budget a little longer. You can also have no spend weeks when you are trying to eliminate impulse purchases. You can eat through your cabinets, find free ways to entertain yourself and avoid non-necessity purchases of any kind at all costs. What I like most about no spend weeks is that it challenges you to get creative and work with what you have. You might find some items in your home that you forgot to use, try out a new recipe that is a hit with your family or establish a unique way to do something which can help you avoid spending more money in the future. Sometimes we make purchases we don’t really want or need to fill a void or relieve stress. My one horrible impulse purchase was picking up candy from the gas station or store whenever I was feeling restless or stressed (especially when at work). Eating candy helped me feel better temporarily but then I felt like crap afterward because it’s really bad for my skin, my sugar levels and my health in general. Since I couldn’t just ditch work at the time, I tried to manage my stress levels by pacing myself, asking for help with my workload, getting enough sleep at night and trying other alternatives like going for a short walk in the middle of the day to decompress or listening to music with my headphones. Like the title of this post suggests, sometimes you need to ask yourself, ‘Do I really need this?’ Impulse purchases are made quickly and often without thought. If you take a moment to determine whether the item you are considering purchasing is truly something you need or will add value to your life and help you meet your goals, you might not even want to head to the checkout lane with it after all. Another good tip I’ve heard is to sleep on it, literally. Leave the item at the store for the next 24-48 hours and see if you regret not bringing it home. If you forgot about it in that time or don’t remember why you wanted it in the first place, the answer is simple. Controlling or even eliminating impulse purchases is not easy and can take some time. Think of it as getting rid of a bad habit. Research shows it takes around 21 days to get rid of a bad habit or adopt a new one. Stick to these strategies for at least 30 days and try to prioritize your goals and values as well. If it’s not broken, no need to buy a new one. If you feel like you have too much clutter in your home already, you probably don’t need more stuff. If it’s just a fad, you might have some regrets later when the item doesn’t satisfy you any more or you can’t even get rid of it by selling it. Stopping impulse buys is an ongoing process so it’s best to take it week-by-week and month-by-month. Be patient with yourself and keep your long-term financial goals in mind. 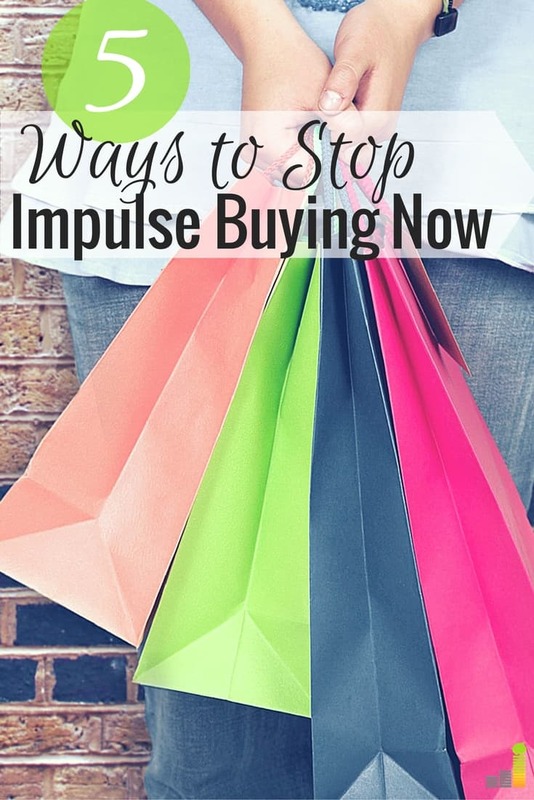 Have you ever struggled with making impulse purchases? How do you control that urge to spend money on certain things? What was the last thing you bought on impulse? If you could go back in time, would you return it – or are you glad you grabbed it? All good tips. I think the biggest thing is that if it’s a purchase you want to make that isn’t on a ‘list’ that you give yourself time to think about it. Many times you will end up backing out of it and not miss the item at all. That’s what I’ve done a few times. I don’t actually make lists for my needs but I might get into the habit of that because it works so well with groceries. Not shopping is a great way to avoid impulse buys. I’m lucky in the fact that I severely dislike shopping and malls. It also helps to stay busy so you’re not rushing out to shop because you’re bored. There’s a big outlet mall out here that I haven’t been to in years and I was reminded why when I took my son to the store to look for shoes for school. It was a circus and I couldn’t wait to leave. I used to like shopping and going to the mall but now I just find it a hassle since I’m not a fan of crowds and lines and there are better things I could be doing with my time. This is a great article! I think these tips will help me spend less. I love no spend days/weeks! Best tip. That has helped us a ton in sticking to our grocery budget– you are forced to use what you have. I feel the same way about no spend days. I usually come out of it with a new dinner recipe my family loves! These are all great tips to think about! I am a huge impulse shopper so I definitely need to try out a no spend week! I definitely get what you’re saying here. I rarely go to Target because of my little impulse habit and I know that they have stuff I want all the time! Something my husband said to me years ago, just as I was getting ready to tell him about an awesome item I had found. “Did you see anything you can’t live without?” He just meant it as an expression, but it stopped me in my tracks. To this day, I think about it every time I go shopping.